Despite being the WorldTour team with the most victories in 2018 so far, Quick-Step Floors are still in the hunt for a new primary sponsor as its current naming sponsor looks to play a smaller role from 2019. Talking to Belgian newspaper Het Nieuwsblad, team manager Patrick Lefevere confirmed that he is still looking for a new primary sponsor to take over from the Belgian flooring company as they look to continue on as a secondary sponsor, therefore reducing its financial input. 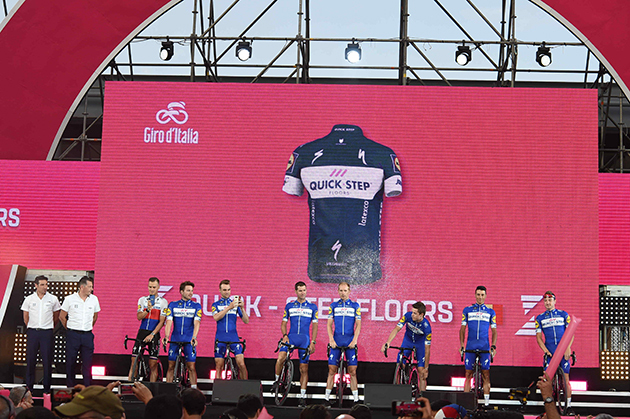 Team Quick-Step Floors is presented before the start of the2018 Giro d'Italia. 'Quick-Step Floors will stay for at least another three years, but they would prefer to become a second sponsor,' Lefevere commented at the finish of Stage 1 of the Binckbank Tour. Quick-Step Floors were primary sponsors of the team from its creation in 2003 until 2011 before it became second fiddle to Omega Pharma from 2012 to 2014. Etixx nutrition took up the mantle in 2015 before the flooring company reassumed the role in 2017. It was a day where the breakaway made it to the finish line and fought for the victory on stage 3 of the Binck Bank Tour. BORA – hansgrohe sprinter Rudi Selig battled with D. Groenewegen out of the bunch and finished seventh, while T. Van der Hoorn won the stage with more than one-minute gap over the main field. The race crossed the border from the Netherlands into Belgium for the third stage of the Binck Bank Tour. The 175km long stage took the riders from Aalter to Antwerpen, where two final laps awaited the riders. After yesterday’s short Time Trial, the sprinters would be eager to get back on the road and challenge for the win on a flat finale. Today was a day for the sprinters, therefore it was to be expected, that several teams would work hard to see a bunch sprint at the end of the day. BORA – hansgrohe focused again on their sprinter Matteo Pelucchi, who finished stage 1 in 7th position. Almost right from the drop of the flag, a small group of five riders managed to escape from the peloton and built up an advantage of more than three minutes. After the chase was put on in earnest by the bunch, the gap was still two minutes with 30km to go. The main field pulled hard to close the gap, but the breakaway worked perfectly together, and as the group headed into the final laps in Antwerpen everyone knew, the winner will be one of these five riders. Meanwhile the peloton fought hard to close the gap, all sprinter teams worked together to make the impossible possible. But the group had enough advantage to make it to the finish line. It was T. Van der Hoorn who took the stage win ahead of M. Vantomme. BORA – hansgrohe sprinter Rudi Selig sprinted with D. Groenewegen for the win out of the bunch and finished in seventh position. The rest of the BORA – hansgrohe squad finished safely in the main field. 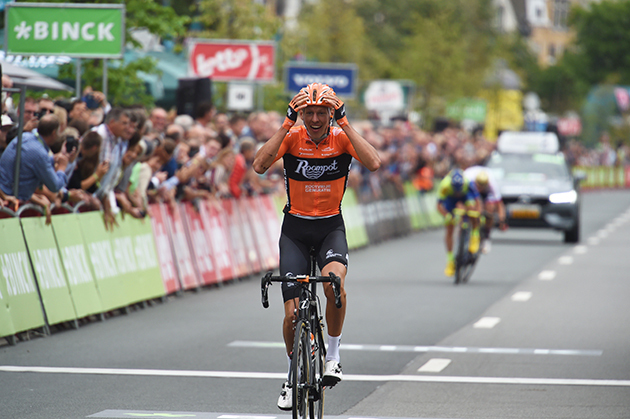 Taco Van der Hoorns wins the third stage of the BinckBank Tour. Dani Martinez and Taylor Phinney headline a strong #PinkArgyle squad for the Colorado Classic. The pair are joined by Nate Brown, Hugh Carthy and Joe Dombrowski, part of the team classification victory at Tour of Utah, and staigiare Jose Neves. 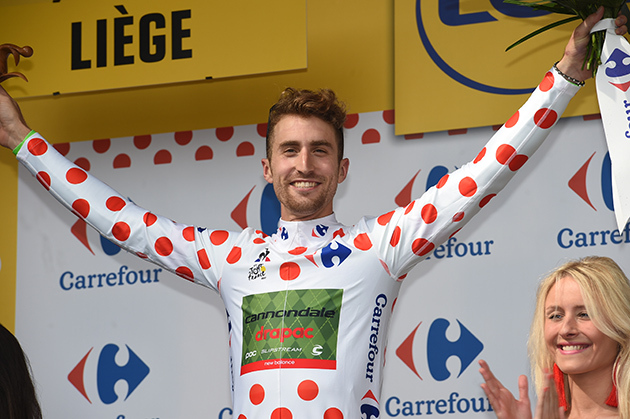 Taylor Phinney last year, after the second stage of the Tour de France. The second of those two stages is expected to be the most decisive of the four-day tour. Used in Coors Classic and USA Pro Challenge, the Vail time trial course makes its first Colorado Classic appearance. The challenging course climbs 480 meters over 15.88 kilometers. Beyond the time trial, the Colorado Classic features two comparatively flat circuits to open and close out the race. Both measure around 100 kilometers, and the relatively short distance could force disruptive racing. The third stage of Colorado Classic is the longest and hilliest of the race. Beginning in Denver’s RiNo district, the 162-kilometer day races by Coors Field, climbs Lookout Mountain and passes through Red Rocks Park. A reduced bunch will likely contest the stage at the Velorama music festival on Saturday afternoon. Neves makes his #PinkArgyle debut at the Colorado Classic. The 22-year-old has largely raced at home in Portugal with a few stints in nearby France and Spain. On the 25th of August, the third Grand Tour of the year, the Vuelta, takes off. The course of the 73rd edition promises to be the scene of another spectacular three weeks of racing. Lotto Soudal performed strongly last year as the team returned from Spain with four victories, including two stages won by the Polish Tomasz Marczyński, one by the combative Thomas De Gendt, and one by Sander Armée, who became Lotto Soudal’s best ranked rider on the general classification. Tomasz Marczyński wins stage six of the 2017 Vuelta. 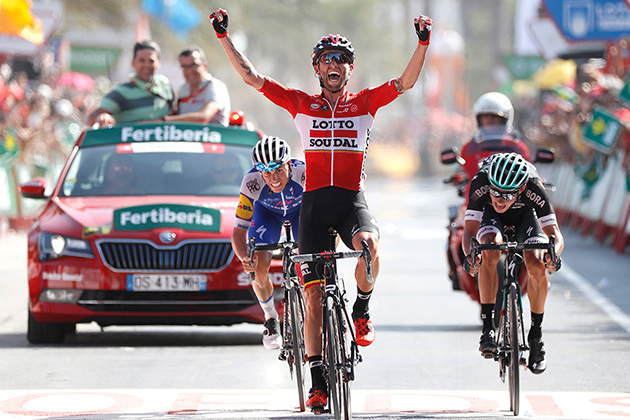 The three stage winners will also be at the start in Malaga during this year’s edition: Thomas De Gendt (sixth participation), Tomasz Marczyński (fourth participation), and Sander Armée (fourth participation) hope to repeat last year’s victories and to help the other Lotto Soudal riders in their pursuit of a stage win as well. Tiesj Benoot (first participation), Bjorg Lambrecht (first participation), Maxime Monfort (eight participation), Tosh Van der Sande (fourth participation) and Jelle Wallays (third participation) complete the line-up. Sports director Mario Aerts comments on the team’s line-up and hopes for another strong performance in this year’s Vuelta. Line-up Lotto Soudal: Sander Armée, Tiesj Benoot, Thomas De Gendt, Bjorg Lambrecht, Tomasz Marczyński, Maxime Monfort, Tosh Van der Sande and Jelle Wallays. Tour de France stage winner Simon Geschke is the latest rider to sign on with Continuum Sports in 2019 in a move that will see the German rider change teams for the first time in his ten-year career. General Manager Jim Ochowicz praised the 32-year-old's ability as a teammate as well as a rider who maximizes personal opportunities. "Simon Geschke has forged an impressive career to date, including his 2015 Tour de France stage win, and will bring a wealth of experience to the team. Simon is a specialist when it comes to the Ardennes classics and Il Lombardia so he will add strength to our team for those one-day races, whether it be in a support role or making the most of opportunities that come his way. From a Grand Tour perspective, Simon has 11 participations to his name and in addition to a Tour de France stage win, he has played a fantastic role in supporting his respective team leader over the years which makes him an asset to our team," Ochowicz explained. "It has been two years since we had a German rider on the team so it is great to have Simon with us. We have more and more German races on the calendar and German fans are very passionate about cycling. The German market is also important for CCC, our new title sponsor for 2019, so we are very excited to welcome Simon to the team." 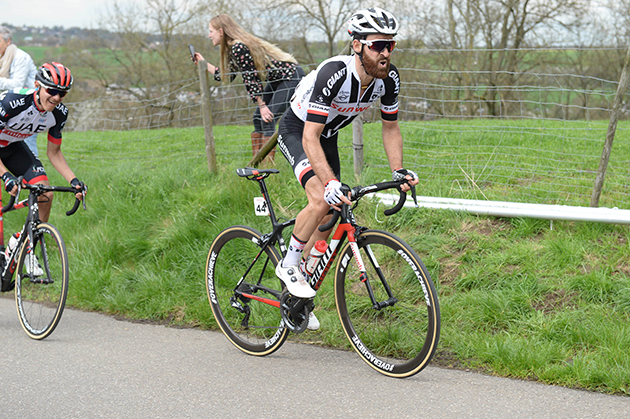 Geschke has recorded top ten finishes at multiple one-day races throughout his career, including Strade Bianche, Amstel Gold Race, and Gran Prix Cycliste de Quebec. After ten years with Team Sunweb, Geschke felt it was the right time to move on when an opportunity presented itself with Continuum Sports, currently operating as BMC Racing Team, in 2019. "I was looking for a new challenge after ten years with the same team as that is a long time. I wanted to change teams at least once in my career and I thought this year would be a good time, and then this opportunity came up so I took it. The team has always appeared to be very professional, and the structure is very good with the sports directors and performance team so that really impressed me. From the outside, it looks like a team with a great atmosphere. I think I will feel good in the team and will settle in well," Geschke said. "I will take next year as it comes. I'm looking forward to doing the Ardennes classics as they have always been some of my favorite races in the spring. Mostly, I'm just excited to get involved with a new group of people and see how it goes."